Most people consider the coffee shop craze to be a 21st Century thing, with its roots in the 1990s. Historians of London will know that in fact it was a massive social phenomenon (among men, anyway) in Georgian London, fuelling trade, theatre, insurance, publishing, literature, philosophy, medicine all the things, in fact, that made London a modern city and a great global city. No sphere of public life was untouched by the proceedings of the coffee house. But actually, it all started in the middle of the previous century, during the Commonwealth. The man responsible was a Greek Sicilian called Pasqua Rosee. He was the manservant of an English merchant, one Daniel Edwards of the Levant Company. 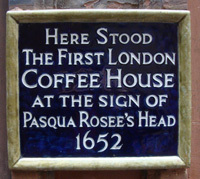 Pasqua opened a coffee stall in the churchyard of St Michael Cornhill. Despite the hot black liquid being rather disgusting, the little shop became an instant hit as a meeting place. Others emulated the exotic coffee vendor and the coffee house phenomenon took off, surviving various attempts to suppress it, not least by Charles II himself. 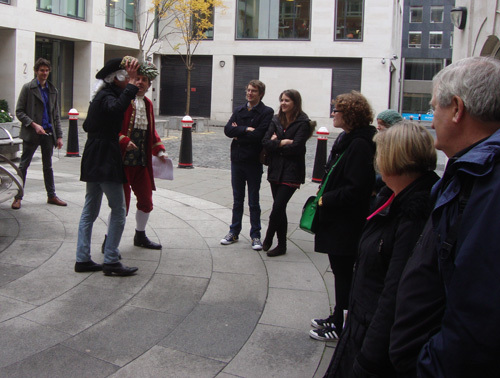 These are the bare bones of a delightfully rich guided tour we took last Saturday, presented by Unreal City Audio. I say presented because it is just that. Dr Matt Green does the tour-leading and academic talking, while his cast of supporters act out various roles, mainly an extremely exuberant Pasqua Rosee. There are also contemporary songs. It’s different, it’s a great deal of fun, and it’s greatly informative: Matt Green knows his stuff and I learned loads. 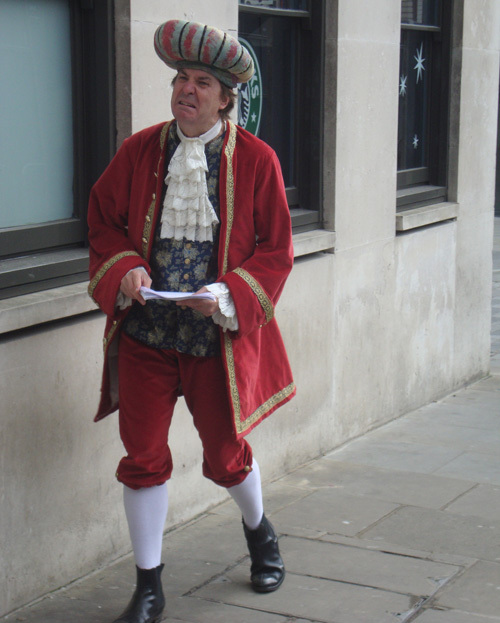 The tours last about two hours and cost £13.50, except to London Historians members, who pay £10. 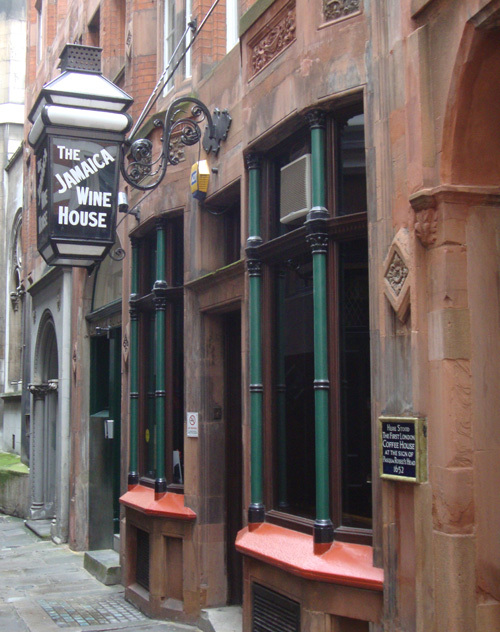 Site of the famous Jamaica coffee house, more or less the same position as Pasqua’s operation. 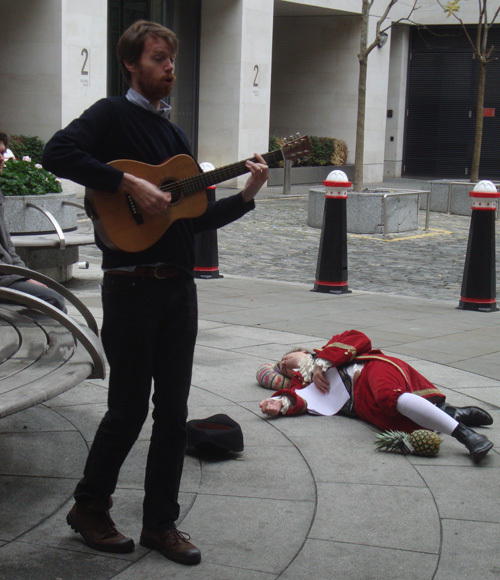 The demise of Pasqua, killed by a pineapple. Okay, a bit of poetic licence at this bit. The most famous of them all. 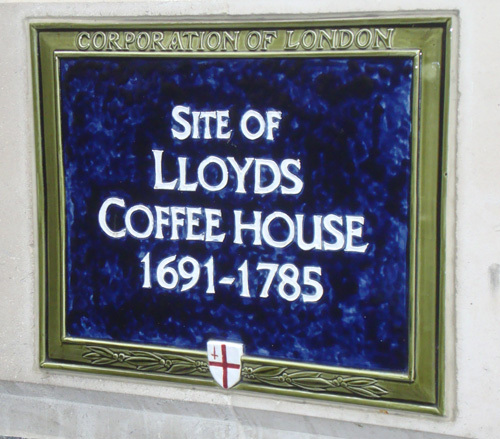 Lloyds transmogrified to the giant Lloyds of London insurance brokerage we know today. Venerable City pub. 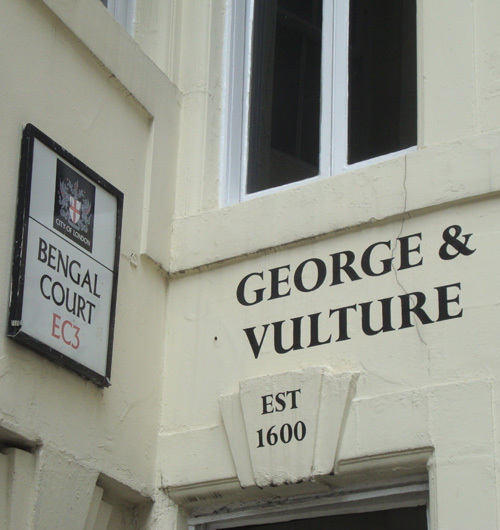 And yes, there was once a real vulture tethered outside, to the consternation of many. 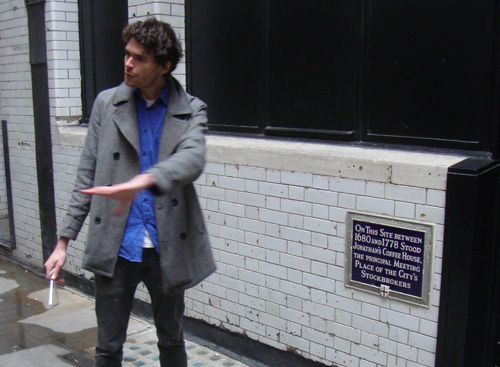 Tour leader Matt Green at the site of another famous London coffee house: Jonathans.